The floating city of Columbia will be open to visitors this fall. BioShock Infinite, the next installment of Irrational Games' famous plasmid-fueled franchise will be released this year on October 16th in North America and October 19th internationally. The Xbox 360, PlayStation 3, and PC editions will be available simultaneously. 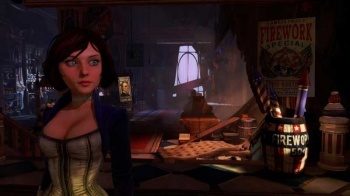 BioShock Infinite is the third game to carry the BioShock banner, but only the second from developer Irrational Games. And while Infinite should be familiar for most players in terms of art direction and funky genetic super powers, the story and scope (set in a floating, jingoistic 1912 version of America) will be much different than Jack's previous undersea adventures in Rapture. "After BioShock, we had a vision for a follow up that dwarfed the original in scope and ambition," said Ken Levine, Creative Director of Irrational Games. "BioShock Infinite has been our sole focus for the last four years, and we can't wait for fans to get their hands on it." There's yet to be any announcement of preorder bonuses or special edition bundles, but those specifics are sure to roll out as we speed closer to October.